If you’re planning a trip to the South Pacific and want to fly into Papeete, Tahiti (PPT) in French Polynesia, your flight choices are pretty limited. It’s a long haul from the United States–Los Angeles to Papeete takes about 8.5 hours–so you’ll probably want to fly in business class. Let’s compare two airlines that can get you from Los Angeles to Papeete in style: AirFrance and Air Tahiti Nui. While Qantas, American Airlines, and other carriers offer codeshare flights from the West Coast to Tahiti, only AirFrance and Air Tahiti Nui fly their own planes on this route. Which option is best for you depends on what frequent flyer currency or flexible bank points you have. If you’re lucky enough to be able to book on either airline, we’ll also discuss what makes the choices different, including the aircraft used, ground services at the airport, the comfort of the seats in the business class cabin, inflight meals and beverages, entertainment and more. Aircraft: Air France flies Boeing 777-200 wide-body jets from Los Angeles to Tahiti. Ground Services: Business class passengers have an exclusive check-in lane at the airport and preboarding privileges. While Air France doesn’t have its own lounge at LAX, you are able to use the Korean Air Lounge. In Papeete, Air France makes arrangements for you to enjoy the Manuhiri lounge. 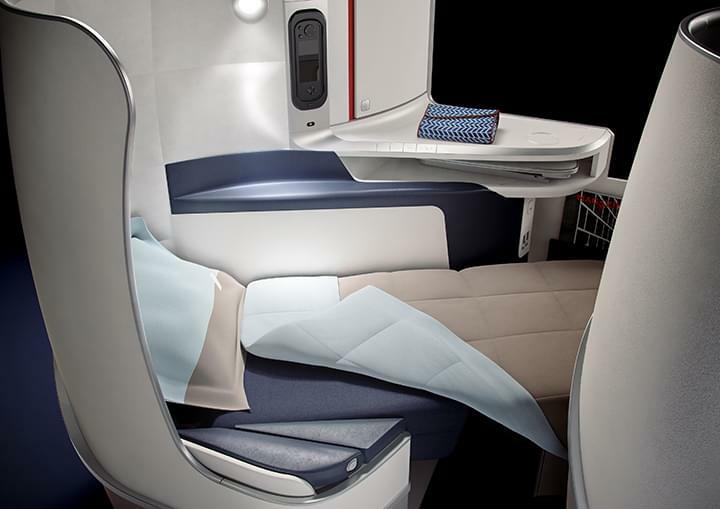 Seating: Air France’s business class seat is a fully flat bed (up to 6.5 feet in its bed confirmation) that offers direct access to the aisle for every passenger. That’s a nice feature. Couples should select seats in the center of the cabin. These pods have a removable divider between them so you can spend time together on the flight or put the partition up if you want complete privacy. When you’re ready to get some sleep, you’ll enjoy an extra large hypoallergenic feather down pillow as well as a comfy duvet. Extra Amenities: Air France provides business class passengers with noise-cancelling headphones for onboard use, as well as a complimentary travel kit including Clarins moisturizer, eye mask, lip balm, slippers and socks, a shoe horn, dental care items, earplugs and a comb. Onboard Entertainment: Air France offers 500 hours of on-demand video programming, including classic and current movies, foreign films, concerts, documentaries and TV series, plus a variety of music channels and games. Business class passengers each have a personal 16-inch high-definition touchscreen. Food and Beverages: Air France excels when it comes to catering in the sky. Expect plenty of aperitifs and Champagne, like Billecart-Salmon Brut or Henroit Brut Souverain, poured in Jean-Marie Massaud stemware. The wine list is studded with excellent options from vineyards in every corner of France, such as Languedoc Rouge’s Chateau de La Soujeole Malepere and Haut-Medoc Chateau Citran from Bordeaux. Savory and sweet snacks are available, along with fruit and cheese, pastries and sorbet, and some of the best inflight meals you’ve ever had. All menu items are designed by Michelin-starred chefs, including Regis Marcon, Michel Roth, Guy Martin and Daniel Boulud. Use Flying Blue miles (the official frequent flyer currency of Air France and KLM) for a business class award from LAX to PPT. Classic Business awards on this route from Air France start at 60,000 miles roundtrip. You can also use miles from any SkyTeam partner. Alaska Airlines partners with Air France, so you can use 60,000 Alaska Mileage Plan miles for one-way flights to Papeete. Or, transfer American Express Membership Rewards, Chase Ultimate Rewards points, Citi ThankYou points or Starwood Preferred Guest Starpoints to Flying Blue to book your award ticket. Tip: Unlike other frequent flyer programs, FlyingBlue will allow you to put an award on hold. The hold lasts for 48 hours, but double-check with the reservations agent in case their terms have changed. You don’t need miles in your account to hold a reservation. This makes it much easier to lock in the flights you need and then transfer points from another account. 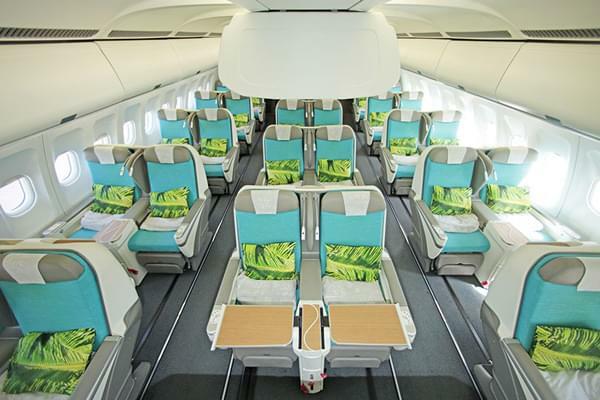 Aircraft: Air Tahiti Nui flies Airbus A340-300 wide-body jets from Los Angeles to Tahiti. 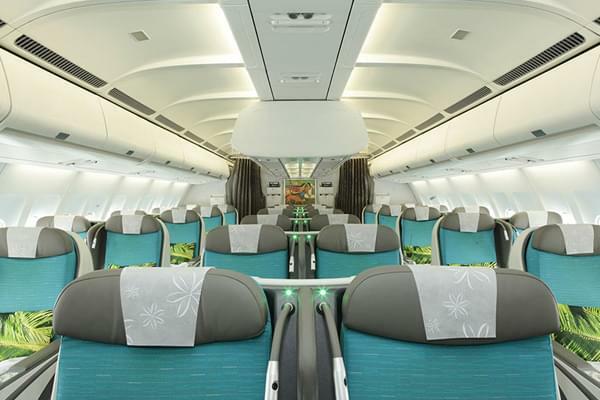 Ground Services: Air Tahiti Nui provides its Poerava Business Class guests with a priority check-in lane at LAX and PPT. While ATN doesn’t have a lounge in Los Angeles, it makes arrangements for its passengers to use the Los Angeles International Lounge, which is a bit ho-hum. And, you aren’t guaranteed access to the lounge. ATN says it’s “subject to availability.” You will have guaranteed lounge access in Papeete, however. Seating: The most important thing you need to know about ATN seating in business class is that it does not lie flat. The seats are still angled when fully reclined. If you can’t sleep in an angled position, you’re best off booking with Air France. Each passenger does receive a pillow and blanket but they aren’t as luxurious as what’s provided on Air France. Extra Amenities: You’ll receive an Air Tahiti Nui-branded toiletry bag that includes the basics like socks, an eye mask, earplugs, a toothbrush, toothpaste and lip balm. The cabin crew also comes around with a basket that includes a few other items you may need, including a razor and shaving cream or moisturizing lotion. The airline provides noise-cancelling headphones for use on the aircraft. Onboard Entertainment: ATN provides an on-demand high-definition touchscreen on the back of every seat. Entertainment options include 16 movies, a variety of TV programs and documentaries, 40 music albums and 15 video games. Food and Beverages: The food served aboard ATN flights is a fusion of Polynesian and French flavors and provisions. On a recent flight, Charles Heidsieck Champagne was served: both Brut and Rose. Wine selections included a Chablis from Louis Jadot, Vin de Tahiti from Blane Mouelleux, Pauillac from Prelude a Grand-Puy Ducasse, and others. Meals are served on a tray, but the crew does prepare your dining area with a tablecloth and glass stemware is used. The airline’s inflight catering does an exceptional job with its cheese plate, so be sure to leave room for it. How to Book an Award Ticket: If you’re rich in American Airlines AAdvantage miles, you can use 160,000 of them to book round-trip travel on its partner, Air Tahiti Nui. If you don’t have AAdvantage miles but have Starwood Preferred Guest Starpoints, transfer them to AAdvantage miles and then book your ATN award through American. Which Airline is Best for Tahiti Travel? 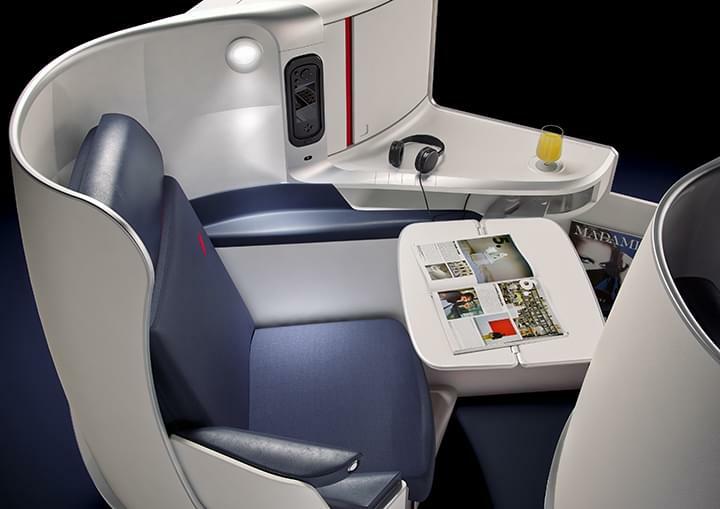 Overall, Air France’s hard product is superior to that offered by Air Tahiti Nui at this time. ATN does have plans to purchase new plans in the future that will have lie-flat seats but until that day comes, Air France is a better choice. You also have far more choices when it comes to using loyalty currency to book an award seat on an Air France flight. If you have your heart set on going to French Polynesia, we think the best way to get there is via Air France.